USB Safely Remove Ayuda - How to install USB Safely Remove for all users? 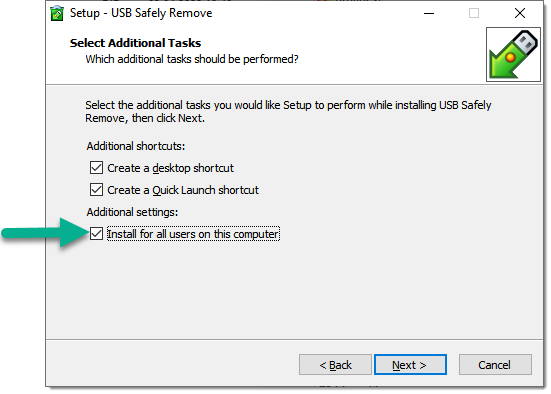 Ayuda > How to install USB Safely Remove for all users? By default USB Safely Remove installs only for currently active user account. It's good when you have only one user account on the computer or share the computer with other people who do not need the program. However if you work under several user accounts or need to install USB Safely Remove in an orgnziation it will be more convenient if the program installs for all users on the computer so that you do not need to enter the license key several times and do not need to setup program auto launching. In order to install the program for all users just choose the option "Install for all users on this computer" during the program installation. This option shares the license key and makes the program to be run on Windows startup (if this option checked in the program) under all user accounts of the computer. It doesn't share any other settings of USB Safely Remove among user accounts.